The number of banks and credit unions actively serving the marijuana industry has jumped nearly 30% from a year ago. But U.S. Attorney General Jeff Sessions’ decision to repeal the Cole Memo may prevent further involvement by banking institutions looking to work with cannabis-related businesses. 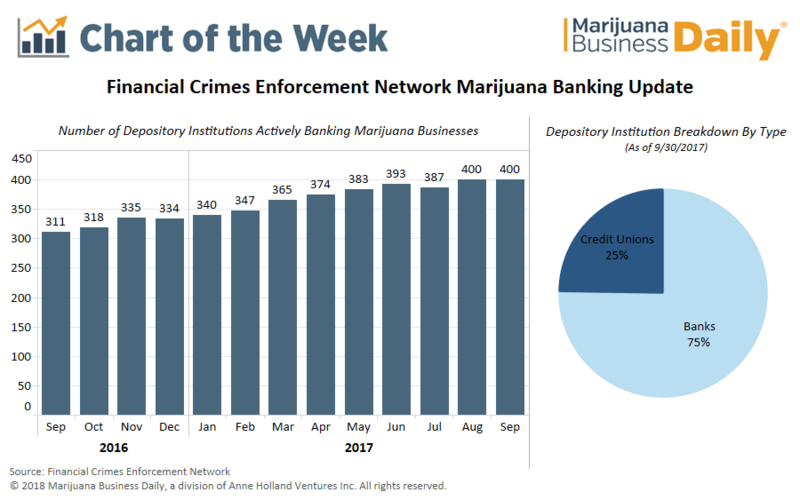 According to the latest report issued by the Financial Crimes Enforcement Network (FinCEN), 400 depository institutions are providing services to marijuana businesses, up from just 51 in March 2014. Guidance outlined in a February 2014 FinCEN memo spurred the increased access to banking services, as it provided banks with a much-needed framework for how to work with clients in the marijuana industry. Generally speaking, the memo requires financial institutions to verify that marijuana companies are properly licensed by the state and to monitor any financial wrongdoing and report suspicious activity to regulators. Although Sessions ripped up the Obama-era Cole Memo protections, banks and credit unions serving clients in the marijuana industry were not immediately affected by this decision – as the guidance outlined in the February 2014 FinCEN memo is completely separate from the Cole Memo. However, the scrapping of the Cole Memo – combined with a top Treasury Department officials’ statement that the Trump administration is reviewing the FinCEN safeguards – has further muddied the water in a situation that was unclear to begin with. Marijuana remains illegal under federal law and the risk – no matter how small – of losing a federal license or incurring some other punishment has proved too much for most financial service providers to stomach. Combined, there are over 11,000 banks and credit unions operating throughout the United States, meaning less than 4% of U.S.-based financial institutions are serving marijuana businesses. Many banks that do provide services to cannabis companies prefer to keep quiet about it, however, making it especially difficult for marijuana businesses to find a financial services provider. Financial institutions that knowingly provide banking services to cannabis businesses often charge a premium for their services. A marijuana business in Maryland recently reported paying monthly fees in excess of $1,700 to use a local bank. Banks account for the vast majority of financial institutions that serve cannabis businesses, with credit unions making up just a 25% share – as shown in the pie chart. This suggests that larger institutions have the resources needed to cater to the marijuana industry, given the regulatory hurdles involved with serving a sector that’s illegal under federal law. In fact, less than 30% of U.S. credit unions manage more than $100 million in assets, according to a report from the Credit Union National Association. Our CU is accepting applications from Cannabis Businesses within our field of membership (FOM) which currently includes all of Clatsop and Columbia Counties in Oregon, and about half of Washington County in Oregon including Forest Grove, parts of Hillsboro, and areas around Hwy 26 as it travels north. We are looking at expanding into more of the state, but don’t have an exact time of when that will happen. We are also serving ancillary businesses within our Oregon FOM and all of Pacific County in Washington. This is a really good article (thank you Eli) but the FinCEN Memo of Feb 2014 isn’t quite “completely separate” in my opinion from the rescinded Cole Memo, because it references the Cole Memo. There are parts of it that are separate and remain in force even in the absence of the Cole Memo though, and as you point out, we all need to carefully watch for any recalibration of that guidance from the Dept of Treasury. There’s also the fact that the industry is lobbying for the passage of the SAFE Banking Act 2017, and as an operator if you can afford the time and $ to support the NCIA’s efforts on this, I think you should. It would massively help everyone.